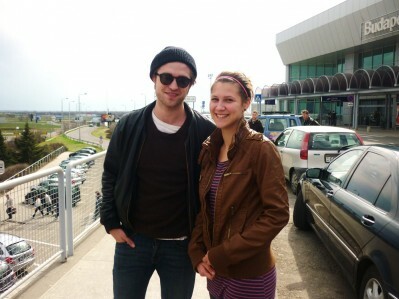 Robert Pattinson and a lucky fan outside Budapest’s Ferihegy airport on Saturday. 6 Responses to "Photo: Robert Pattinson and fan at Budapest airport"
I hope she realizes she just caught the equivalent of the Lochness Monster and Bigfoot combined with that public sighting. Not to mention the fact that he is (a) smiling, (b) wearing sunglasses, and (c) wearing the BEANIE! Hate her. Not really. Kind of. LOL!! and (d) some vera tight jeans! My sentiments exactly. She got the holy grail! Unf. She’s a verrry lucky girl. That kid was in the right place at the right time! Hope she had enjoyed it cause a lightning bolt doesn’t hit someone twice! Really envy her. Nice to see Rob stop and smile to have a picture taken with a fan. In the US or Uk the paparazzi would be all over him and he would walk with his head down and as quickly as he could to get away from them. VERY lucky girl, and I agree…lightning doesn’t strike twice! It is great to see him smile and look relaxed, though I understand why that isn’t always the case when in the USA and UK. Love ya Rob!